Long ago, when I was a youth, Bowers&Wilkins was for me the dominant speaker brand. The record shop around the corner had big B&Ws hanging off the wall. A friend's older brother played with a Lenco - Shure V15 - Quad 22/II - B&W DM4 system. An uncle had, and still has, the small DM5s. Another rock-oriented record store downtown played with the pentagonal and impressive DM3000s. A nephew has the stylish CM2 system, and yet another uncle owned both Bose 901 as well as B&W DM12s (a bit of a schizofren?). 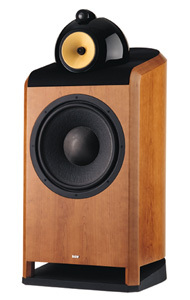 These DM12s, by the way, were the grandmother of the current wave of quality minispeakers, or minimonitors as the Americans love to call them: tiny but perfectly-formed, hard to drive, heavy like lead, and a gorgeous real-wood finish. Sigh: amidst of this sat I, only able to afford a crappy ITT music centre. But when I finally had saved enough for a decent upgrade, I got blown away at a demonstration of a system with Linn LP-12/Ittok/Asaka and Cambridge CD-2 sources, Cyrus One MkII amplifier (which I bought), and B&W DM-100i speakers: neutral, dynamic, open, musical! At that time these tiny speakers, courtesy of B&W's 25th anniversary and associated generosity, cost no more than EUR120. Per pair, that is. Pops up then that dealer who insists on me hearing the new and rather over-the-top Nautilus 801. Because of "dynamics hitherto available only from Wilson" and, knowing my personal tastes, also "more musical, more British sounding". If I was interested? Like that other time, not so long ago, I did not think but promptly uttered "I do". First a few things on B&W's new sibling. Not quite being a replacement for the legendary DM-801 monitor, which still shall remain in production for a while, the Nautilus 801 should really be seen as a more 'affordable' offspring of the trendy and cost-no-object Nautilus project. As such, the 801 is characterised by open-backed transmission line loading for both the metal dome tweeter as the cone midrange speaker. These transmission lines lead most of the backwards radiated sound away from its transducer, confronting the latter with a near-ideal acoustic load. Speaking of the midrange: this is really a special cone speaker, as it dispenses almost totally with the usual roll surround. The rim of the cone itself is practically rigidly coupled to its basket, and hence the cone acts as if it were its own suspension. This could only be done in a system where no bass energy whatsoever is routed to the mid speaker. Then the woofer. This is a biiiiiig cone (15") in a biiiiiig matrix box. Inert and heavy. The lower section of the speaker looks familiar enough. The upper section, though, is a clone of the original Nautilus: smoothly contoured teardrop shapes, executed in some moulded stuff. These shapes were chosen for a minimal diffraction of the radiated sound, resulting in better stereo images and higher neutrality. And to end this story, the midrange head is decoupled with an elastomer suspension from the woofer box, and the tweeter head is likewise decoupled from the midrange. Fit and finish are exemplary, the 801s certainly looking like the money they cost. And what's more: despite their enormous bulk and weight, these speakers do blend in rather nicely in a living room. Although the smaller 802, of course, does an even nicer job of blending in. Gorgeous-looking stuff, but go and see for yourself, because the pictures shown here don't do them any justice. And so we assembled a 'matching' system around these behemoths: Krell KAV-300cd CD-player into KRC-2 line preamp, and then to two gigantic KAS-2 power amps lurking on the floor. Warmed up. This was to be an expensive listening test! A Sony SBM recording, Yo-Yo Ma's "Inspired by Bach" cello concerti, fared much better indeed, depicting the solo instrument in all its glory, from the deepest and most sonorous lows to the rich harmonics of the strings, and the sounds made by Ma when touching the cello here and there. Literally "here" and "there" in the sonic vista! Also nice to hear was The Walkabouts' "Devil's Road", especially the opening track. A melee of thundering bass and bass drum, emotional vocal lines, fresh acoustic guitars and jangling electric guitars, and underlying all of this, far away yet sublimely detailed and natural, a complete string orchestra doing its job. Still, playing more pop and rock discs I got the feeling that the sound was each time and again limited by the source material. Some CDs sounded awfull, others were tonally and dynamically utterly right, yet made me think that smaller detail was wiped away, that something was missing. Or in other words: with such a dynamics and such a wide ranging sound one was led to expect the detail to be at the same level, but it wasn't there. Why? Because it was never recorded, to begin with!!! Verifying this with better software, be it well-recorded classical or things from more audiophile labels, the detail and balance simply was there, all of the time: the B&Ws are analyzing monitors, they'll show you what's on the disc. Pretty much without mercy. Which is a good thing if you aim for the professional market. And yet they are not aggressive or harsh. The tonal balance is very even, although seemingly tilted a bit towards the top, with a natural midrange entirely devoid of hi-fi sheen. 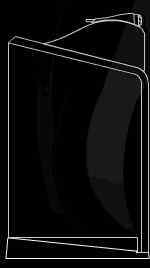 In fact, I found them a lot like an idealistic electrostatic speaker, sounding like a big Martin Logan, but absolutely without the characteristic 'plasticky' colouration of remember of ML's Sequel and Aerius models. The bass was very tight and lean, perhaps a bit too lean for my tastes, well controlled and going very deep, without any trace of overhang or resonance. An amazing thing is that so far we played, to me, rather loud. And so far the whole lightshow on the Krell power amps remained dulled: the current meters just perceptibly moving and the Plateau Biasing in stasis at the lowest class A level. Then in went Janis Ian's "Pop". Up went the volume control. There she was, in the room. All things nicely being as before. And then, then I felt like struck with a hammer. A drum kit got loose. And the Krells spawned blue fire from their LEDs. These speakers can go LOUD. And DEEP. And UNDISTORTED. All at the same time. We didn't put the Krells or the B&Ws to their limits, as far before that we reached the limits of the room, of our ears, and surely of good taste! One system I know that does the same is the ATC SCM-100A active monitor. But that one is not as open nor refined as the 801s. Another sledgehammer is the huge Acapella horn system with plasma tweeters, but that one sounds so large that it is almost surrealistic. The Nautilus 801, though, kept things more in proportion, musically speaking. Oh, and aforementioned Janis Ian disc contains some Q-Sound surround effects. Now I have heard Q-Sound before, but never placing sonic images right to my side, and almost behind me. Or at least not with such accuracy! This is a remarkable feat, indicating these speakers' response and phase linearity, their lack of colouration and diffractive second-order emissions, and of course their excellent pair-matching. After cold-blooded analysis came sultry synthesis. What if we ditched the Krells and put something more human in tow of the Nautiluses? Sheerly by accident we had a new Italian integrated amplifier at hand: the Synthesis Nimis. This is an entirely dual-mono - right down to duplicating every control button - EL-84-based push-pull valve amp that emits 12 lushious Watts. The dimensions of this thing are petite, and all controls are sitting on top of the wood-encirkled housing. Desirable, and not a little bit. The more so since this beauty only costs EUR1000! As driving the biiiig wooooofer of the 801 with above collection of glass bottles was out of the question, we settled for the 802. This speaker copies the 801 in the midrange and treble, but is much narrower and sports two 20cm woofers. Sensitivity is a few dB lower, but the end result is a speaker that's quite a bit easier to handle altogether. The CD player, by the way, was the Naim 3.5. Asserting my earlier feelings that the Nautili are transparent un-speakers, the sounds greeting us were the anti-thesis of what we got with the Krells: warm, lush, inviting. But still pretty much controlled, with a wonderfully rolling deep bass, sufficient dynamics for my tastes, and all in all a remarkably 'complete' view on the music. And this from a EUR9000 speaker driven from a EUR1000 amplifier. So much for the surviving flat-earthers and their "source first" paradigm. Or dogma. Or whatever. So you take a Nautilus and you take a big class A transistor amp and you get a technically excellent sound. And you take a Nautilus and you take a weensy tube amp and you get musically excellent sound. There must be customers for both approaches. Let's try this for an analogy. You can take a picture of a landscape with the most perfect camera, using colour-true film and processing, so that the end result is almost photometrically 'correct'. And you can make a picture of the same landscape through a red-filter, perhaps using IR-film, and having a lot of creative post-processing. Will viewing the former give you the idea of 'being there'? Does the latter? Which one appeals more to your art-loving soul? The same dilemma has been haunting audiophiles ever since the inception of reproduced sound.